I strive to delight each of my clients with not only the taste and presentation of their wedding cakes but also the experience of working with me. Throughout the process of consultation, design, quoting, and general communication, I aim to build a level of trust with you so you'll feel comfortable leaving an important aspect of your event in my hands. I'm so pleased to share these kind words from my amazing clients! Can I give 6 stars? Heather is THE BEST! From start to finish I knew we were in great hands. She truly cares about each of her clients and personalizes each of her cakes and experiences to the couple. We LOVED LOVED LOVED our personal cake that she designed in gold foil for us. We also had 3 different types of cupcakes on our dessert table that guests were raving about all night long. Creative flavors, gorgeous work, and the best person to work with. One of my favorite wedding vendors - definitely recommend!! Heather was a joy to work with in all aspects of the planning process. She was warm, professional and truly talented - her passion for cake (and each couple) shines through her work. From the moment we had our tasting with Heather, I was blown away. Her cake flavors are unique and the quality and taste are unbeatable. 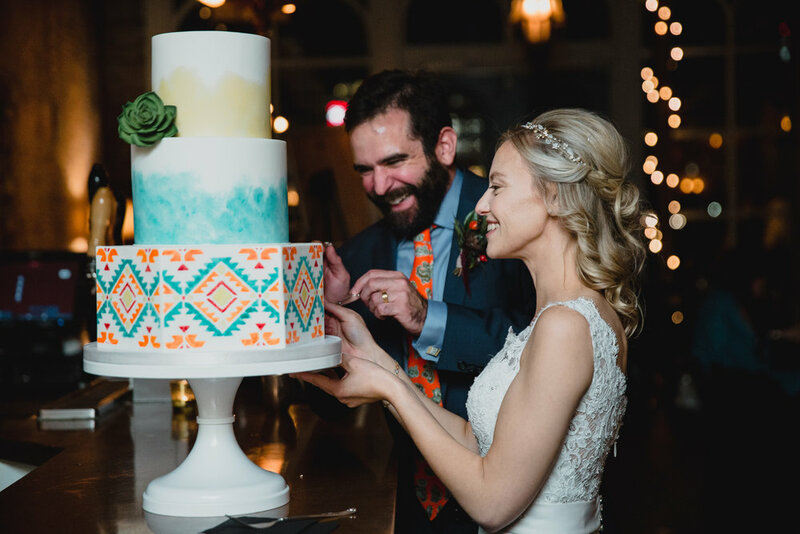 I have never been a huge cake person, but I left our tasting with complete certainty that we had found a perfect match to bring our wedding dessert dreams to life! I couldn't imagine a better result and would recommend Heather and Enticing Icing to anyone in a heartbeat!! We were so glad that we chose to work with Heather for our wedding cake. She worked with us to create a truly unique and gorgeous cake for our wedding. Shortly after our initial meeting, I had second thoughts about what I wanted and Heather rolled with it to help me narrow down exactly what I wanted. She was personable and made us feel like our cake was special. The end result was so beautiful that our guests thought it was fake until they tasted it, and then they raved about how good it was. When I first saw our cake at the venue my mouth fell open. It looked exactly like the design. If you're looking for a cake that will taste as good as it looks, you should absolutely choose Enticing Icing!